I started writing this right before all of the upheaval began, but I loved the way this meal turned out, so I wanted to go ahead and post. To say that Korean cuisine and I got off to a rough start might be employing the use of descriptive restraint – this was not love at first bite. Despite my lifelong adventurous palate, I wasn’t quite ready for the “guppies” in the panchan to be staring forlornly up at me while I ate them, and it’s possible that I may have used the word “compost” when describing my first impression of garlicky, spicy, fermented cabbage kimchee. The combination of flavors, the pungent and spicy fermented twang of the cabbage – it took me a few determined tries to get through my initial impression and to fall hard for the unique personality of the cuisine. Korean flavors are among my favorites now. They make my taste buds sing in a unique way, like the intriguing contrasts found in curries, while being specifically Korean. 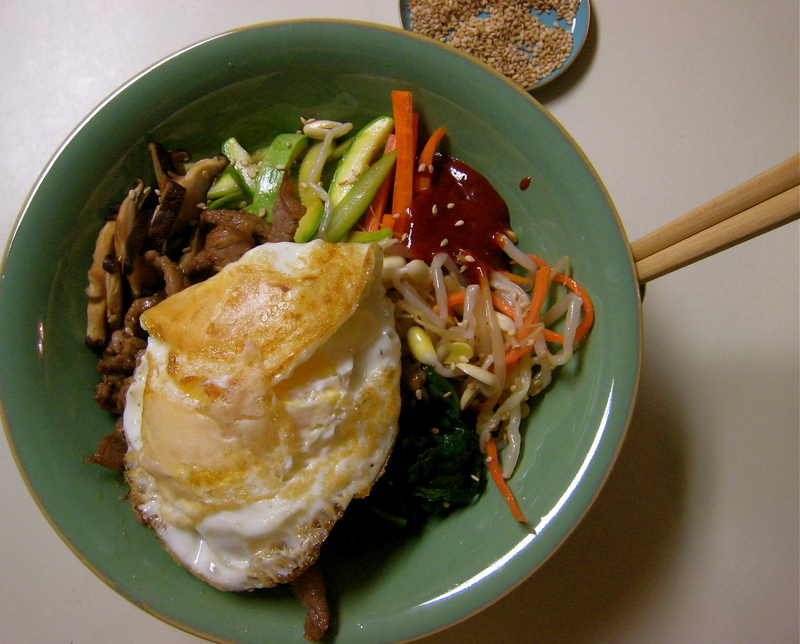 A more gentle introduction through a friendly and adaptable dish like bibimbap may have eroded my resistance a little faster. 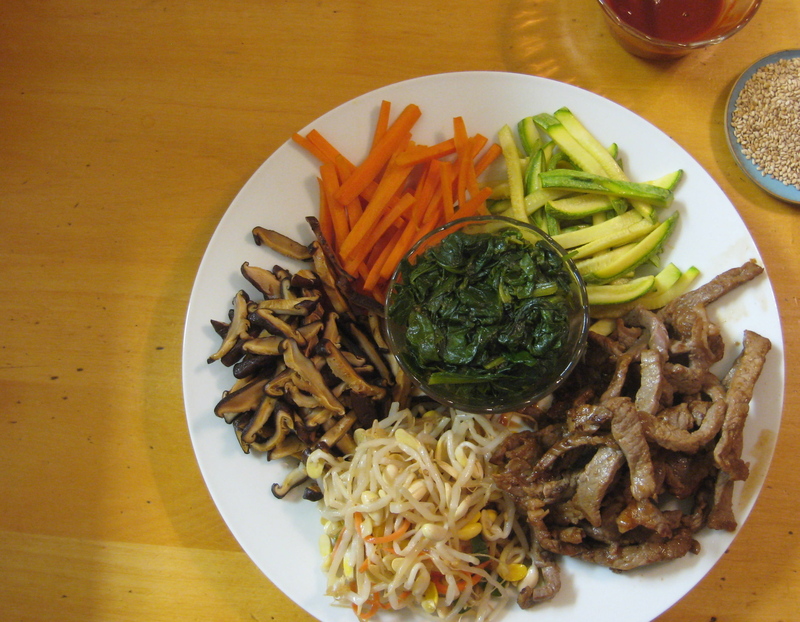 Bibimbap is a great casual dinner party meal for the same reasons that it makes a good intro to Korean food. It’s adaptability, use of easy-to-find ingredients and touch of exotic alongside the familiar make it a crowd pleaser and vegetarian friends can just leave out the meat and have the same experience as everyone else. I’ve included a (not necessarily comprehensive) list of ingredients, but use what you like or can easily find. I’ve written the recipe in a cook-as-you-go style since it can mostly be made ahead and either re-warmed or served at room temperature, so don’t be intimidated by the length of the ingredient list since there are a lot of repeats. handful of mung bean sprouts (or buy the prepared sprouts in a Korean market- they are usually included in the banchan at a meal), blanched in boiling water for a minute or two and drained. As each element is cooked, pile it on a large platter (think of it as the “salad bar”). When everything but the egg is cooked, scoop a pile of warm rice into your largest soup bowls and arrange all of the bits of mushroom, spinach, bean sprouts, meat, on top. 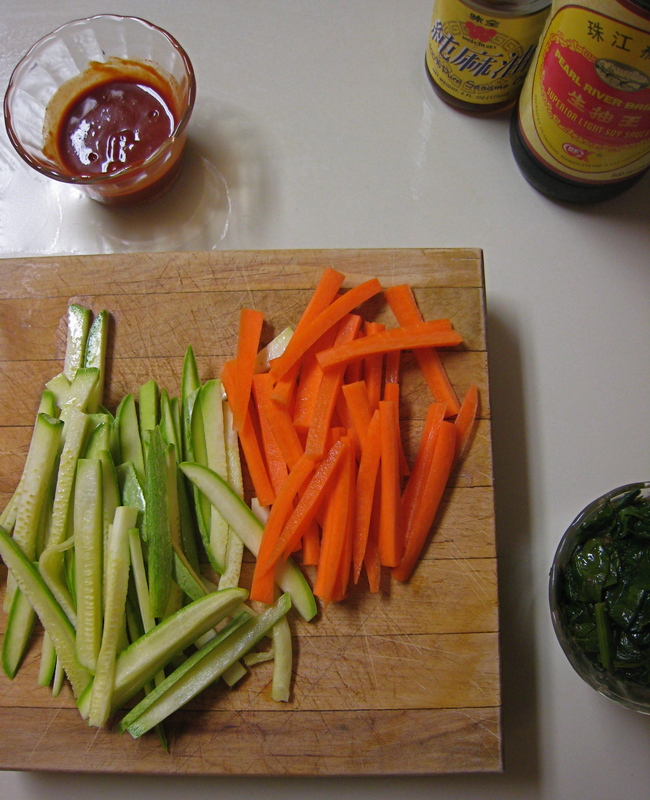 Put a dollop of the gochujang in the middle and sprinkle with the toasted sesame seeds. Top with the fried egg and then step back and take a look at it; it should look like a very prettily composed salad. Now take your chopsticks (or fork) and mix it all up into a big mess, getting the egg and pepper paste thoroughly mixed into the rice and vegetables.